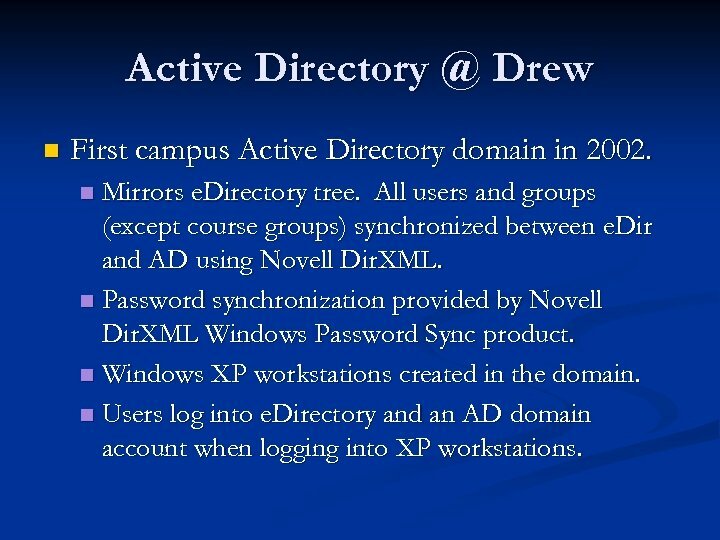 Drew University Computer Initiative n n n Started 20 years ago in 1984. 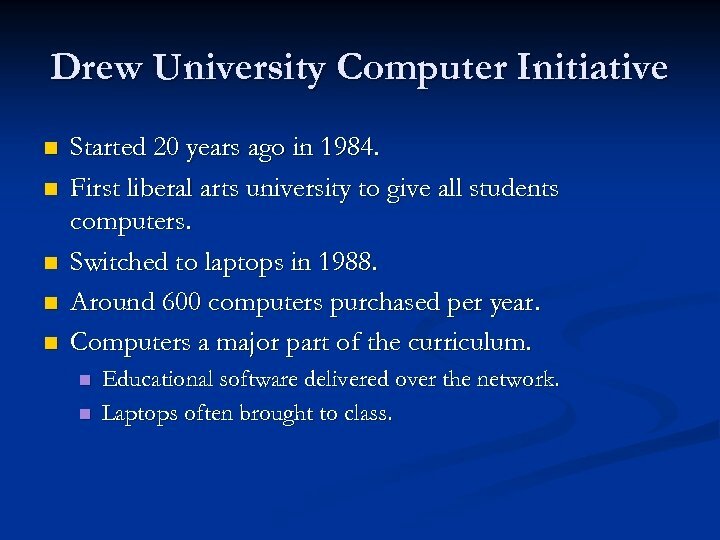 First liberal arts university to give all students computers. Switched to laptops in 1988. 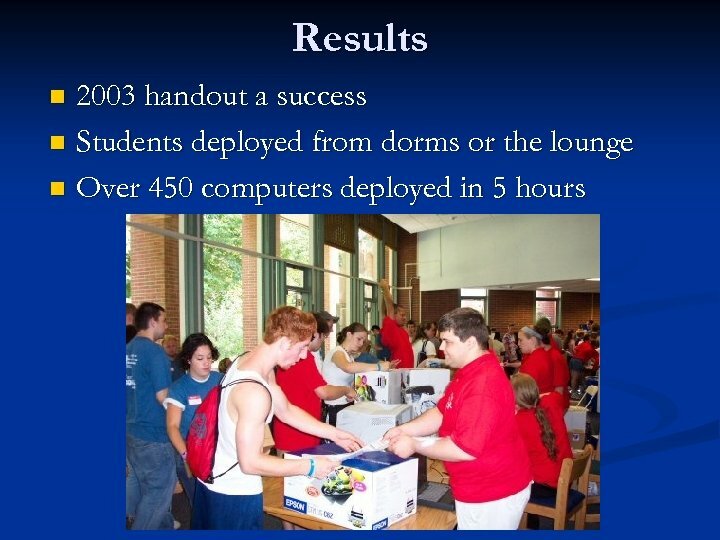 Around 600 computers purchased per year. Computers a major part of the curriculum. 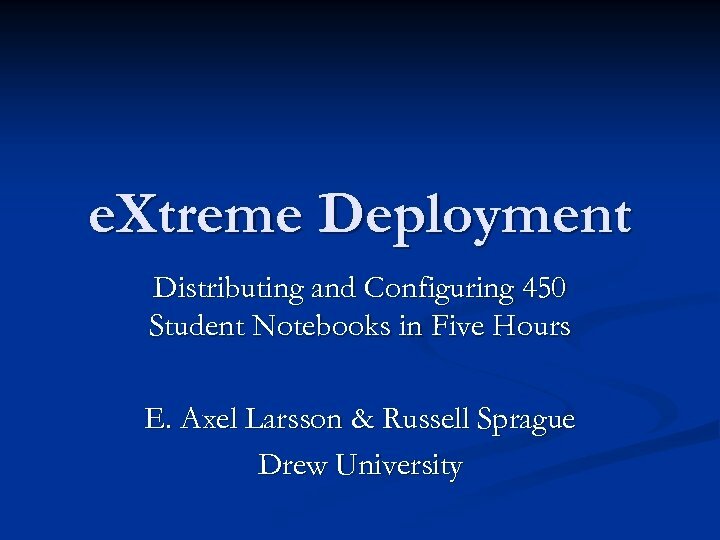 n n Educational software delivered over the network. 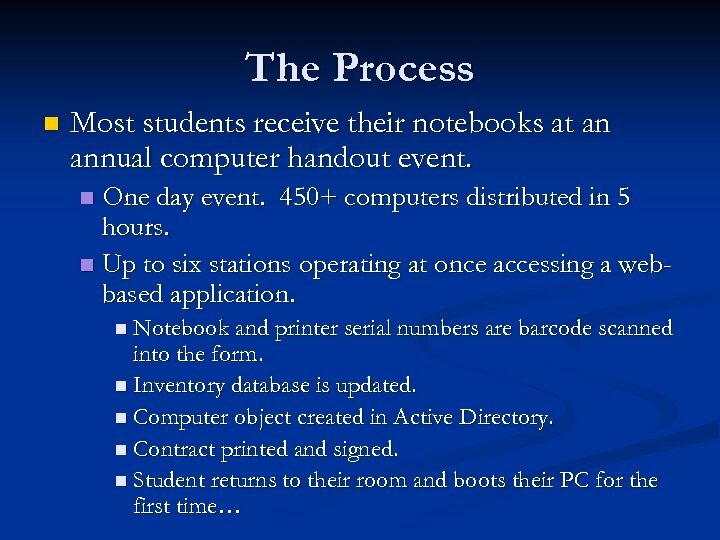 Laptops often brought to class. 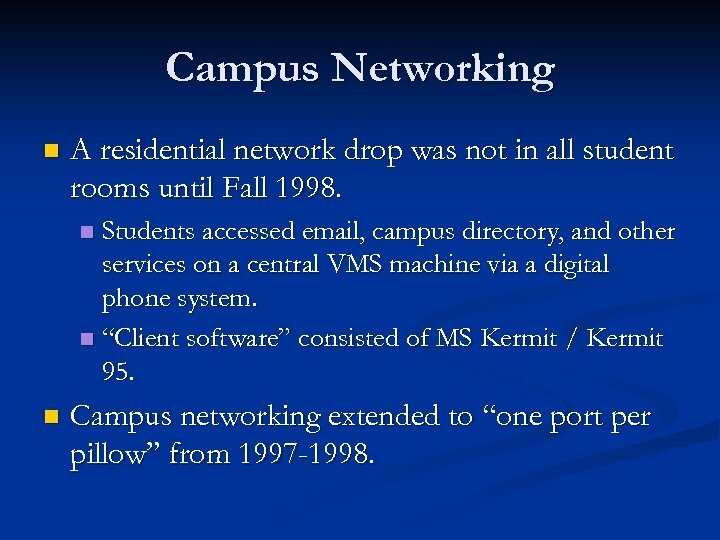 Campus Networking n A residential network drop was not in all student rooms until Fall 1998. 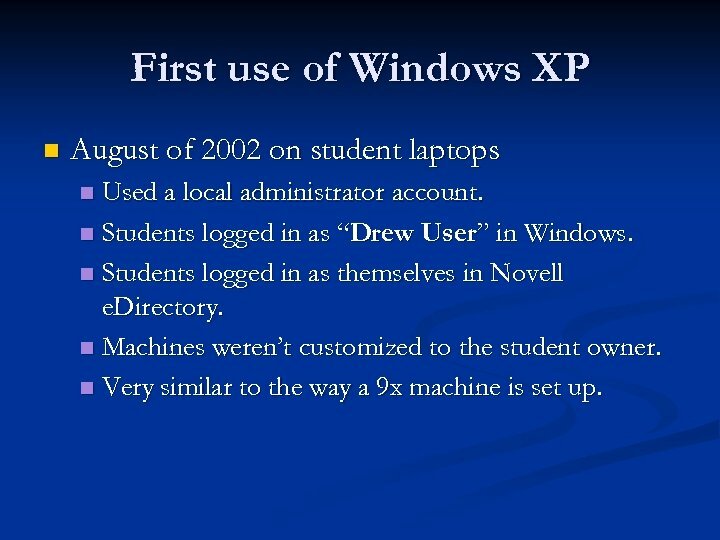 Students accessed email, campus directory, and other services on a central VMS machine via a digital phone system. 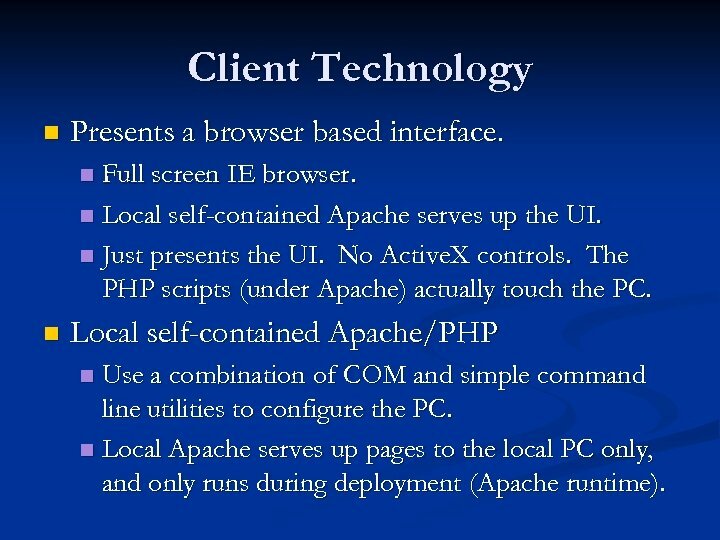 n “Client software” consisted of MS Kermit / Kermit 95. n n Campus networking extended to “one port per pillow” from 1997 -1998. 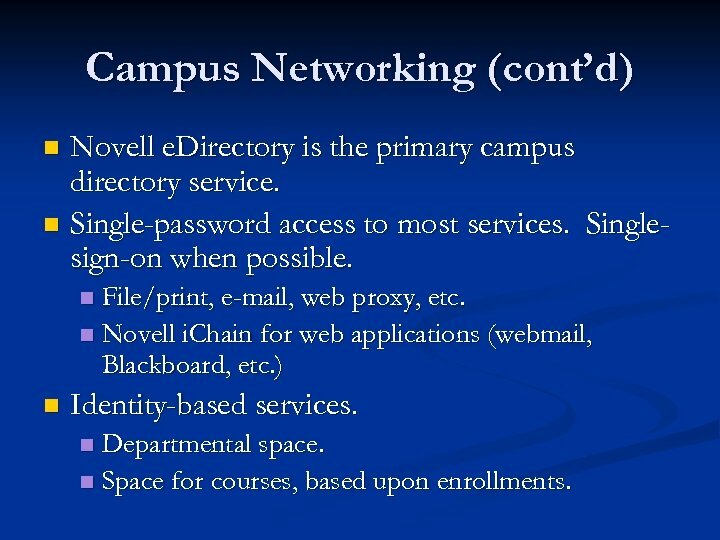 Campus Networking (cont’d) n Management of workstations n Novell ZENWorks for Desktops n Application launcher delivers apps to users “on demand”. n “Force run” apps deliver needed patches and updates. 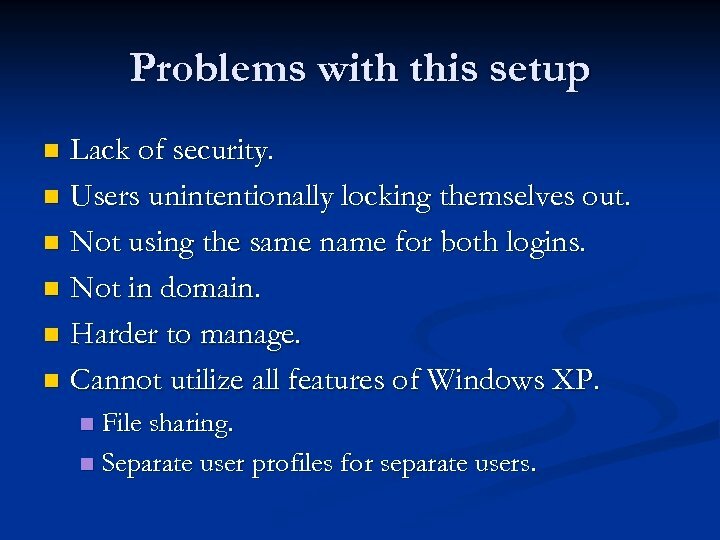 n Limited use of user policies and 95/98 workstation policies. n Limited deployment of Win 2 K in labs n ZENWorks “dynamic local user” feature to manage local user accounts. 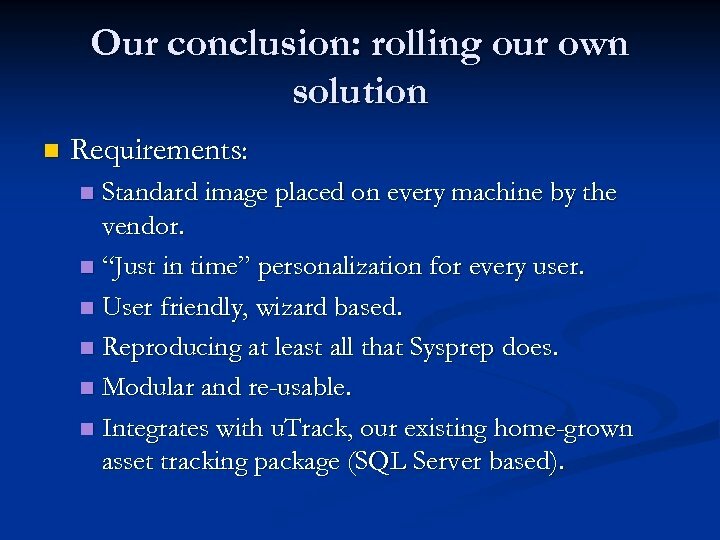 n Limited ability to manage DLU on a per-workstation basis. Other deployment difficulties. Using Existing Skills n Experience with web-based applications. 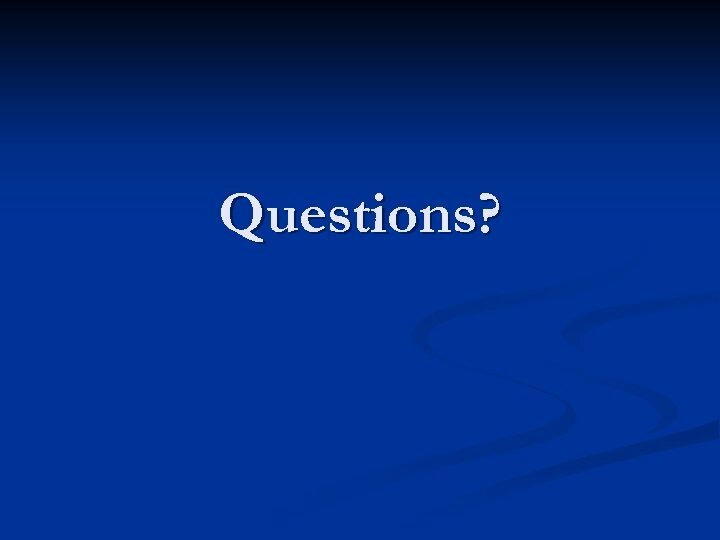 Lots of experience developing database driven web applications in PHP, Perl, and Python. 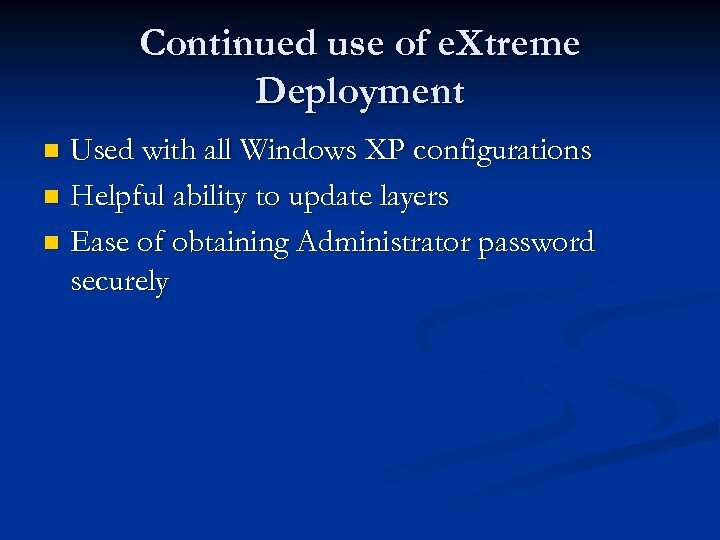 n Very little in house experience with Windows application development. n n Limited time-frame mandated skill reuse. n n 3 weeks to design and develop the complete solution. Decided upon a web based client. Backend Tech. 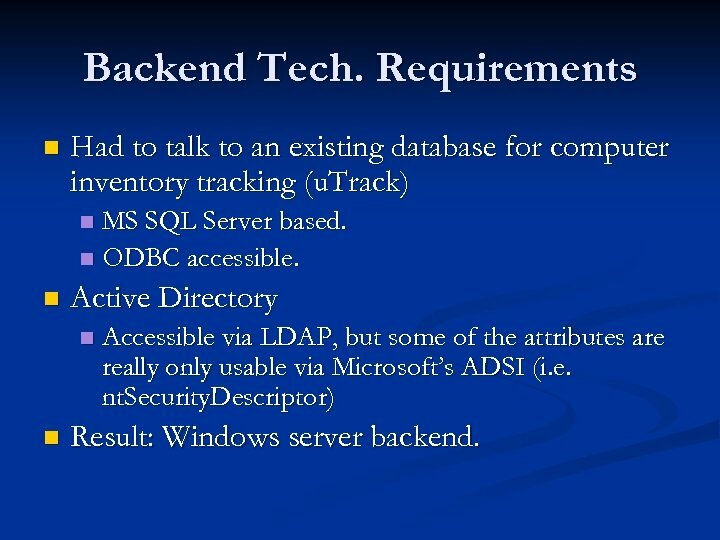 Requirements n Had to talk to an existing database for computer inventory tracking (u. 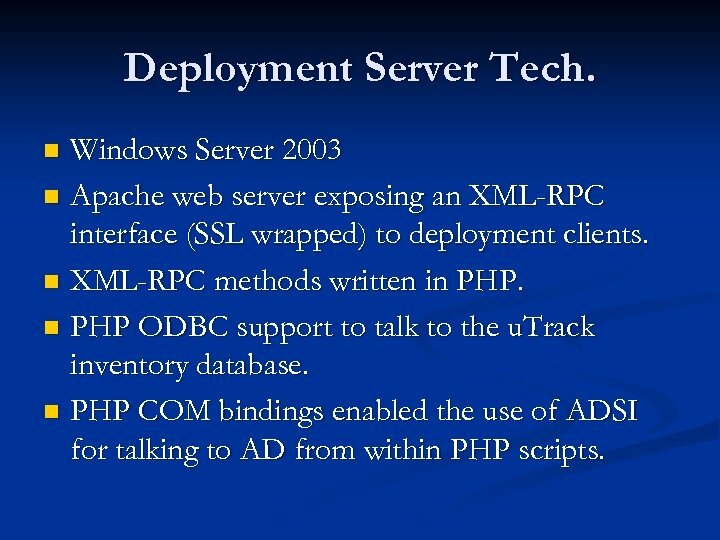 Track) MS SQL Server based. n ODBC accessible. 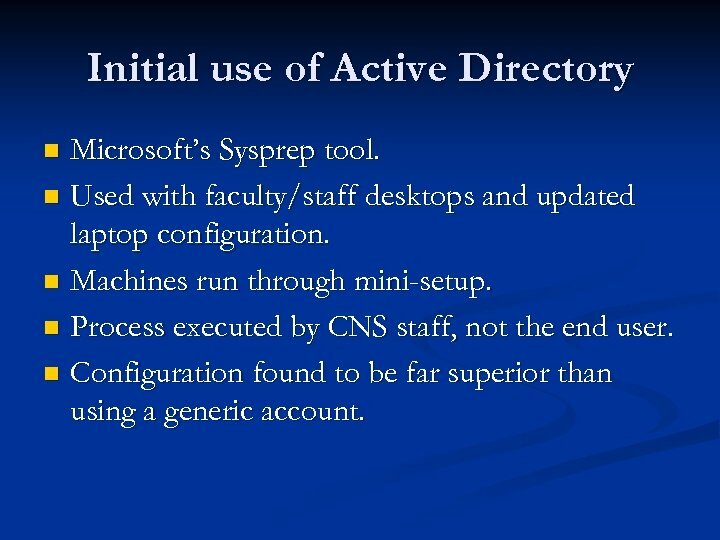 n n Active Directory n n Accessible via LDAP, but some of the attributes are really only usable via Microsoft’s ADSI (i. e. nt. Security. Descriptor) Result: Windows server backend. 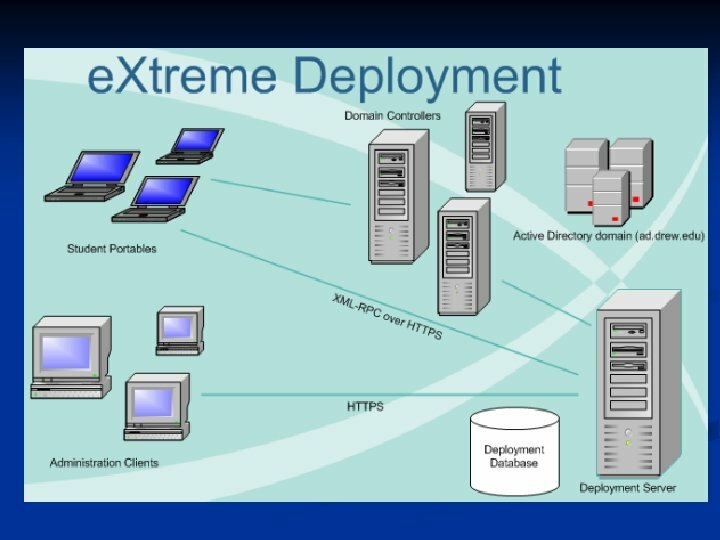 Deployment Server Tasks n n Provides updated versions of the XD client components to clients. 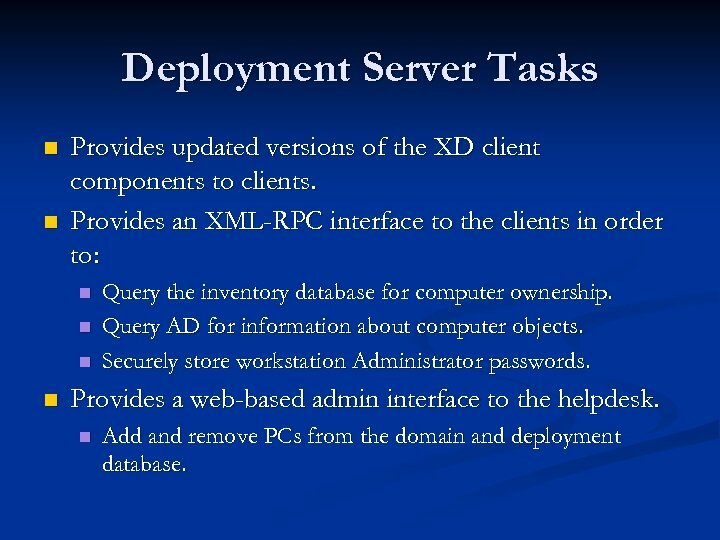 Provides an XML-RPC interface to the clients in order to: n n Query the inventory database for computer ownership. Query AD for information about computer objects. Securely store workstation Administrator passwords. Provides a web-based admin interface to the helpdesk. 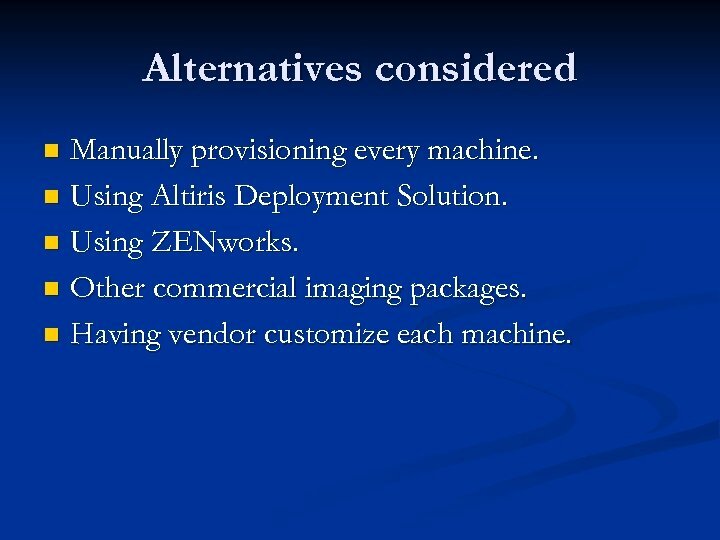 n Add and remove PCs from the domain and deployment database. 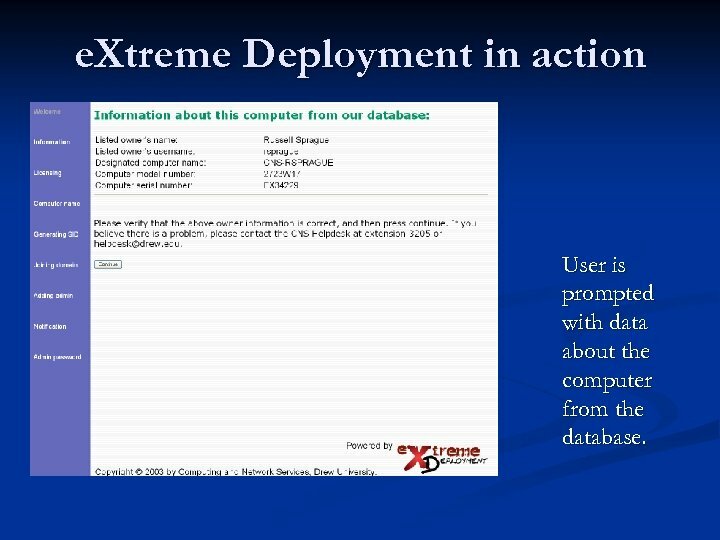 e. Xtreme Deployment in action User is prompted with data about the computer from the database. 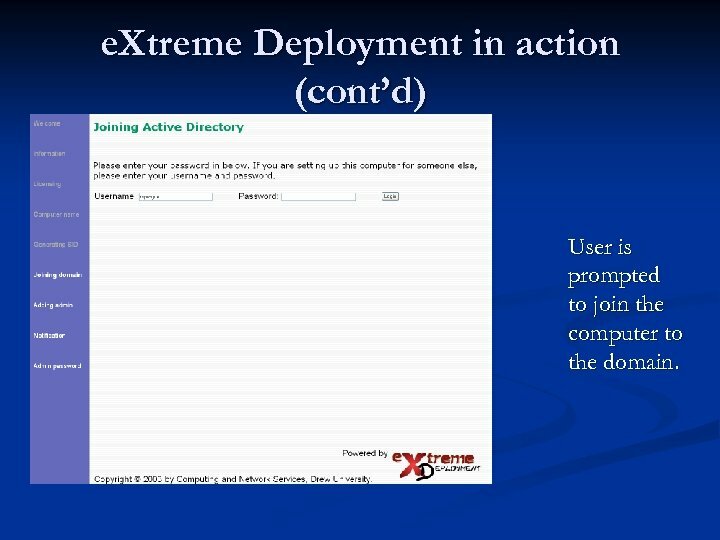 e. Xtreme Deployment in action (cont’d) User is prompted to join the computer to the domain. 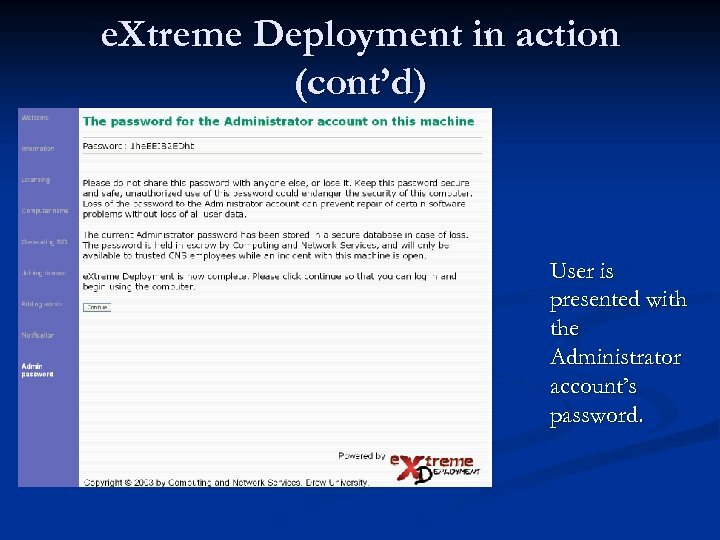 e. Xtreme Deployment in action (cont’d) User is presented with the Administrator account’s password.